What Role Should the U.S. Play in the Middle East? The shortsighted plan for punitive strikes in Syria fails to address how the U.S. will fit into the aftermath. A few dozen missile strikes will not alter the military balance in Syria’s civil war. They will not punish Syrian President Bashar al-Assad to the point where it moves him to the bargaining table. The Syrian autocrat is engaged in a ruthless fight for survival. Obama is not. As long as that dynamic continues, limited military action will have a limited impact. Tomahawk cruise missiles are the latest wonder weapon to be used to lull Americans into thinking they can have war without cost. (For now, they’ve replaced drones.) In a sign of just how limited the American effort will be, the Senate Foreign Relations Committee drafted a resolution Tuesday night that would limit any military action to sixty days, with one thirty day extension. Under the best-case scenario outlined by administration officials, American destroyers will lob a few dozen missiles at Syria late next week. Washington’s credibility will be magically restored. And there will be little pain, risk or casualties for Americans. At the same time, opponents of military action on the left and right argue that we can ignore what is happening in Syria. The Sunnis who make up 70 percent of Syria’s population and their Gulf backers will give up, some argue. Or if Assad wins, a magnanimous Hezbollah and Iran will not be emboldened by his successful use of chemical weapons. In truth, Syria is on a path to become a failed state split between Sarin-wielding Alawites and Sunni jihadists. The largest refugee crisis in the world since Vietnam will destabilize Lebanon, Jordan and Turkey and potentially ignite a regional war. And America’s true red lines — Israel’s security and the steady flow of Middle Eastern oil into the global economy — will be threatened. A gaping hole in the president’s response to Syria is that it does not grapple with the core question: what should America’s role in the Middle East be? Defender of chemical weapons bans? Defender of oil flows? Defender of Israel and no one else? Political realities, of course, limit what type of military action Obama can propose. War weary Americans want no part of another conflict in the Middle East. But they deserve a realistic, clear-eyed strategy in the region. President George W. Bush’s invasion-centric approach to countering militancy clearly failed. But Obama’s hands-off approach is not working either. From the start, Obama has successfully struck a middle ground in foreign policy, using drone strikes and a time-limited troop surge in Afghanistan to appear tough but anti-war. His plan to strike Syria could be the straw that breaks the back of Obama’s split-the-difference approach. Barring a major personal lobbying effort by the president, a skeptical House is likely to reject Obama’s request for an authorization. An ABC News poll released Tuesday found that 60 percent of Americans oppose a unilateral U.S. missile strike on Syria. To be fair, an array of factors beyond Obama’s control have come together to turn Syria into the administration’s perfect storm. Assad’s depravity, Russian President Vladimir Putin’s cynicism and a fractious Syrian opposition make up a rogue’s gallery of stubborn opponents and unappealing allies. And the war in Iraq – which Obama opposed – has created sweeping isolationism. Obama also has himself to blame. Traits that have been steadily building in his administration for the last several years have made Syria harder to solve. First, it is unclear how deeply Obama, in fact, wants to act in Syria. A famously detached president seems half-engaged. 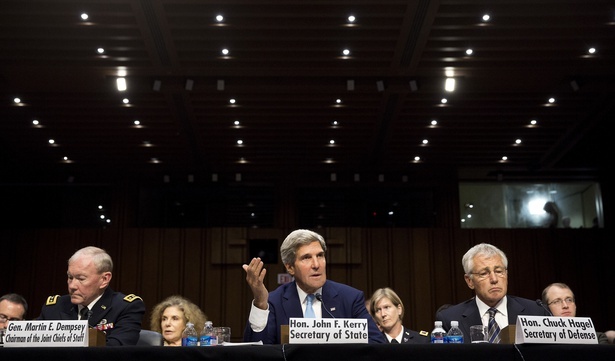 Instead of Obama making impassioned speeches last week to the American people, Secretary of State John Kerry did. After making a surprise announcement on Saturday that he would seek a congressional authorization to strike Syria, Obama went golfing. Tracking the president’s personal involvement in the debate ahead will show his true intent. If Kerry, Defense Secretary Chuck Hagel and others remain the primary administration voices lobbying Congress, it is a sign of Obama’s ambivalence. In an ominous sign for the White House, opposition to the strikes is growing on the far right and left. Lead by Senators Rand Paul and Ted Cruz, libertarians say no vital U.S. interests are at stake in Syria. Citing Iraq, liberals who enjoy generous security and rights at home blithely dismiss the idea of enforcing international norms abroad. As historian Douglas Brinkley noted, one of the oddest things about the American response to Assad’s chemical weapons attack is the lack of moral outrage. Beyond Kerry, few Americans have expressed anger at a barbaric attack that killed 1,400 people, including 400 children. Yes, we must not repeat the mistakes of Iraq. But that does not absolve us from seriously grappling with the nightmarish scenarios that are emerging in the Middle East. There are no quick or easy solutions in Syria. Even if the U.S. acts, it will not stabilize the country. But we need a comprehensive strategy. At this point, the best of several bad options is to mount extensive U.S. strikes, arm the moderate opposition and try to negotiate a political settlement with Russia and Iran. A Tomahawk-created peace is a fantasy.